A lonely steam engine rests on the tracks. It is no longer operational, but it fits well into the image created by the train station. 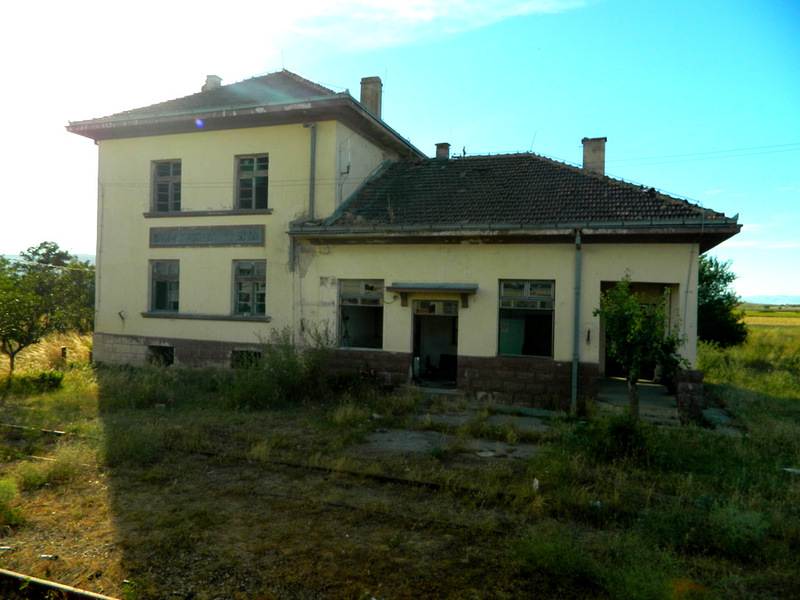 Prilep is the fourth-largest city in Macedonia, but the train station looks like that of a village with a population of 2,000. A dying village with a declining population of 2,000. The four tracks are covered by grass. Four times a day the train from Skopje to Bitola passes through here. 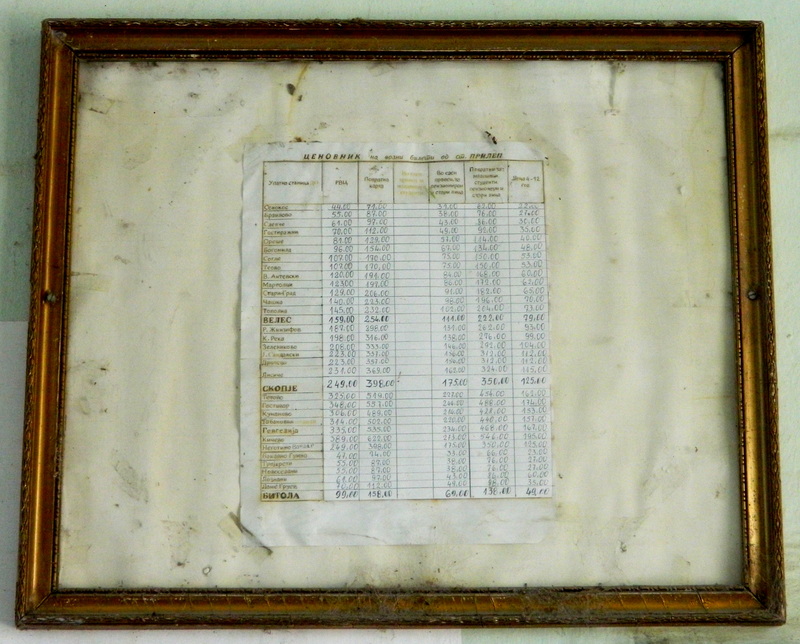 The ticket prices have been entered by hand in a chart that is pinned to the wall behind an insect-covered piece of glass and above the opening from where tickets are sold. The ticket counter is closed. The station clock is 10 minutes slow. 16:45. The sun is still hot, but the shadows are already long. I lean on the wall of the station building which is facing the tracks, my backpack will be covered with chalk later. Some of those waiting have large canvas bags with clothes and household items. Two men are putting sacks of wheat and boxes with tomatoes on the platform. The ticket vendor arrives but goes hiding in his office, unimpressed by the crowd of waiting travellers. From all directions, men are pushing bicycles across the railway tracks. A man wearing the overall of a car mechanic comes onto the platform on a moped. Will that go on the train as well? The wind is blowing cardboard boxes through the scene from right to left. Men in checkered shirts are smoking cigarettes. Opposite from the train station, a horse-drawn carriage with bales of straw passes by twice. The longer the scheduled departure time at 17:12 passes by without anything happening, the more I understand the lack of any urgency on the part of the ticket vendor: of course he knew of the train’s delay. Finally he does open his window for a few minutes to sell some tickets without any apparent sign of excitement. He picks up a 100 denar banknote from the cash register and holds it up to the window to signal me how much I have to pay. I even receive two denars change. 98 denars, that’s 2 US$ for approximately 50 kilometers. Here, you can still take the train just for fun. In the heat and surrounded by the dust, with the view of the mountains and the passengers who are waiting patiently, but with some distance from each other, I have been feeling like in a Western movie for a while already, when an elderly, smaller gentleman’s mobile phone begins to play the soundtrack of “Once upon a time in the West”. I am inching closer to the entrance of the cobwebbed concourse to be able to retreat as soon as the first shots are fired. And then it arrives, the much-expected train. Old and young disembark with heavy bags which they brought from the capital Skopje. The man on the moped is only here to pick someone up. He helps an old woman (his mother? his grandmother?) to get off the train. She is blind. Hopefully she will be safe during the ride on the two-wheeler. The journey from Prilep to Bitola doesn’t attract too many passengers today. The train is sparsely populated, but even emptier is the landscape through which the railroad is battling forward. The evening sun colors the cornfields in shining gold and the meadows in luscious green. 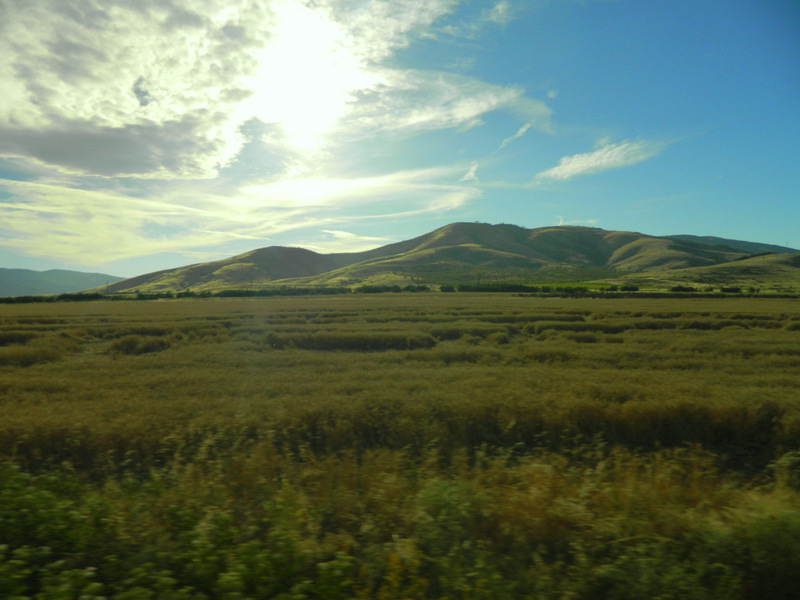 The hills are undulating in perfect shapes. A huge sunflower field on the left; contrary to the rumor about their behavior, the sunflowers have turned their faces away from the sun. The slip stream blows through the windows, twisting the heavy curtains like flags of freedom. We are not travelling fast, almost one hour is scheduled for the 50 km. Again and again the train is convinced to stop in the middle of nowhere by collapsed or burnt-out station buildings. I can’t make out any settlements to which these buildings would belong, nor any roads. People get off, but they still have to walk a few kilometers across the fields before they will get home. 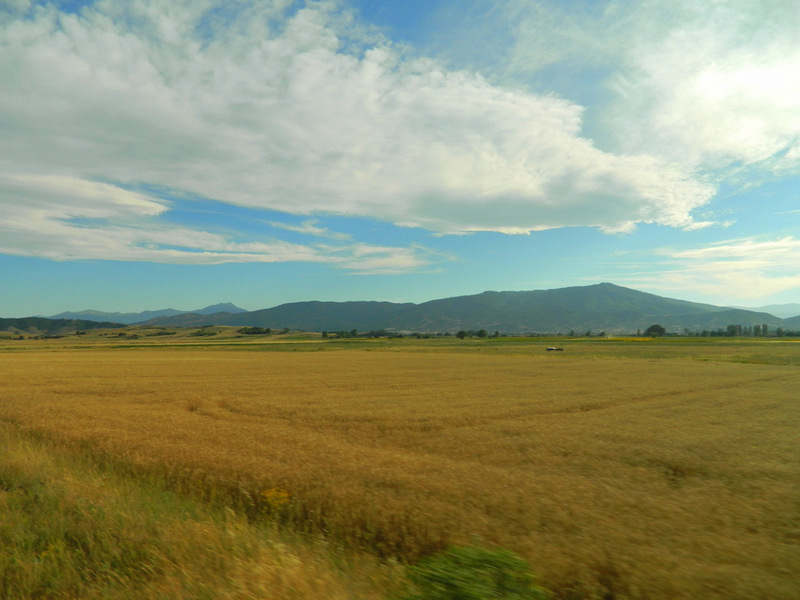 Only outside of Bitola, Macedonia’s second-largest city, human life begins to enter the landscape again. Increasingly often the train has to whistle a warning when crossing roads. Thus, the whole town learns that the evening train is about to arrive. At the station, two men run towards the train carrying a heavy fridge-freezer, which they heave through the door directly behind the driver’s cab. Outside the station, a man leans on the boot of his Audi 80, marked as a taxi only by the yellow sign on the roof. I give him both my backpack and the address in the old town of Bitola where I want to stay. When he gets into the car, he removes the taxi sign from its roof. There is no meter. That’s also a way to do some moonlighting. The next morning during breakfast at the hostel, I talk to an American who complains that the trains in Macedonia don’t have air-condition. I on the other hand loved the trains with open windows instead of air-condition so much, that I am sad that I will have to continue my journey by bus from here on. Because Bitola is the end of the railroad. The direct connection from here to Greece was cancelled in 1991; there is no train to Albania either. 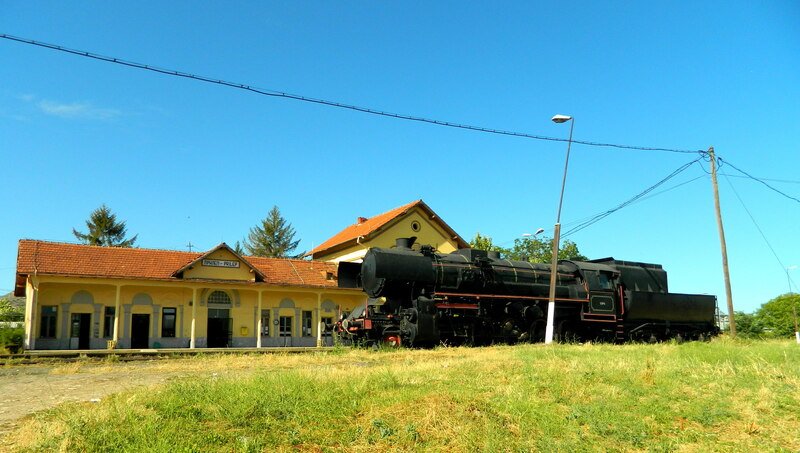 This entry was posted in Macedonia, Photography, Technology, Travel and tagged Bitola, Prilep, train. Bookmark the permalink. Oh! Oh! 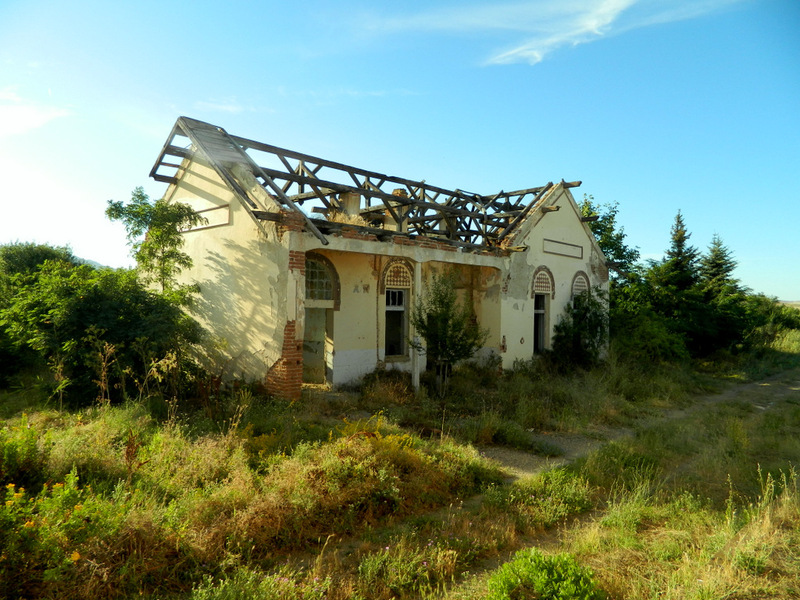 I love those old abandoned train stations and love even more that they are still considered stops! I find that there can be such beauty in old half collapsed or defunct buildings! I wish Canada had more trains but it looks like we are heading toward less and less instead of more and more..
Then I should come to Canada soon, as long as I can still cross it by train. I would love it that it takes longer because it gives me more time to enjoy the scenery and to read. Yes, I had the same thought about splitting it up. For beds and showers, but also to see more of the country.